People with diabetes are prone to many foot problems, often because of two complications of diabetes: Nerve damage (neuropathy) and poor blood circulation. Neuropathy causes loss of feeling in your feet, taking away your ability to feel pain and discomfort, so you may not detect an injury or irritation. Poor circulation in your feet reduces your ability to heal, making it hard for even a tiny cut to resist infection. When you have diabetes, you need to be aware of how foot problems can arise from disturbances in the skin, nails, nerves, bones, muscles, and blood vessels. Furthermore, in diabetes, small foot problems can turn into serious complications. You can do much to prevent amputation by taking two important steps: Follow the proactive measures discussed below-and see your foot and ankle surgeon regularly. Infections and ulcers (sores) that don’t heal. Because of poor circulation in the feet, cuts or blisters can easily turn into ulcers that become infected and won't heal. This is a common-and serious-complication of diabetes and can lead to a loss of your foot, your leg, or your life. 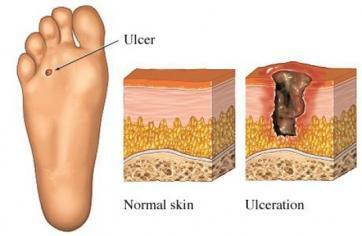 An ulcer is a sore in the skin that may go all the way to the bone. Corns and calluses. When neuropathy is present, you can't tell if your shoes are causing pressure and producing corns or calluses. Corns and calluses must be properly treated or they can develop into ulcers. Nail disorders. Ingrown toenails (which curve into the skin on the sides of the nail) ankle fungal infections can go unnoticed because of loss of feeling. If they're not professionally treated, they can lead to ulcers. Hammertoes and bunions. Motorneuropathy (nerve damage affecting muscles) can cause muscle weakness and loss of tone in the feet, resulting in hammertoes and bunions. If left untreated, these deformities can cause ulcers. Charcot foot.This is a complex foot deformity. It develops as aresult of loss of sensation and an undetected broken bone that leads to destruction of the soft tissue of the foot. Because of neuropathy, the pain of the fracture goes unnoticed and the patient continues to walk on the broken bone, making it worse. This disabling complication is so severe that amputation may become necessary. A major goal of the foot and ankle surgeon is to prevent amputation. There are many new surgical techniques available to save feet and legs, including joint reconstruction and wound healing technologies. Getting regular foot checkups and seeking immediate help when you notice something can keep small problems from worsening. Your foot and ankle surgeon works together with other health care providers to prevent and treat complications from diabetes. The goals of treatment of diabetic foot problems are not only to save the life and limb, but also to get the patient healed and moving about as soon as possible. If vascular surgery cannot improve blood flow and podiatric surgery cannot restore function, amputation may be the only solution that gets the patient walking again. Amputation may involve one or two toes, part of the foot, or part of the leg. It is selected on the basis of the patients condition and level of predicted healing. A return to normal life is especially possible today because of advances in prosthetics. Skin or nail problems - Look for cuts, scrapes, redness, drainage, swelling, bad odor, rash, discoloration, loss of hair on toes, injuries, or nail changes (deformed, striped, yellowed or discolored, thickened, or not growing). Signs of fracture - If your foot is swollen, red, hot, or has changed in size, shape, or direction, see your foot and ankle surgeon immediately. Observe for changes in circulation. Pay attention to the color of your toes. If they turn red, pink, or purplish when your legs hang down while sitting, poor circulation may be a problem. Don't ignore leg pain. Pain in the leg that occurs at night or with a little activity could mean you have a blocked artery. Seek care immediately. Nail cutting.If you have any nail problems, hard nails, or reduced feeling in your feet, your toenails should be trimmed professionally. Diabetes can be dangerous to your feet - even a small cut could have serious consequences. Diabetes may cause nerve damage that takes away the feeling in your feet. Diabetes may also reduce blood flow to the feet, making it harder to heal an injury or resist infection. Because of these problems, you might not notice a pebble in your shoe - so you could develop a blister, then a sore, then a stubborn infection that might cause amputation of your foot or leg. Inspect your feet daily.Check for cuts, blisters, redness, swelling, or nail problems. Use a magnifying hand mirror to look at the bottom of your feet. Call your doctor if you notice anything. Wash your feet in lukewarm (not hot!) water.Keep your feet clean by washing them daily. But only use lukewarm water-the temperature you use on a newborn baby. Be gentle when bathing your feet.Wash them using a soft washcloth or sponge. 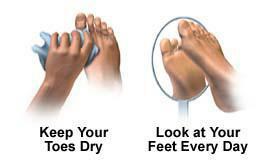 Dry by blotting or patting-and make sure to carefully dry between the toes. Moisturize your feet-but not between your toes.Use a moisturizer daily to keep dry skin from itching or cracking. But DON'T moisturize between the toes-this could encourage a fungal infection. Cut nails carefully - and straight across.Also, file the edges. Don't cut them too short, since this could lead to ingrown toe nails. Never trim corns or calluses.No "bathroom surgery"- let your doctor do the job. Wear clean, dry socks.Change them daily. Avoid the wrong type of socks.Avoid tight elastic bands (they reduce circulation). Don't wearthick or bulky socks (they can fit poorly and irritate the skin). Wear socks to bed.If your feet get cold at night, wear socks. NEVER use a heating pad or hot water bottle. Shake out your shoes and inspect the inside before wearing.Remember, you may not feel a pebble - so always shake out your shoes before putting them on. Keep your feet warm and dry.Don't get your feet wet in snow or rain. Wear warm socks and shoes in winter. Never walk barefoot.Not even at home! You could step on something and get a scratch or cut. Take care of your diabetes.Keep your blood sugar levels under control. Don't smoke.Smoking restricts blood flow in your feet. Get periodic foot exams.See your podiatric foot and ankle surgeon on a regular basis for an examination to help prevent the foot complications of diabetes.